At RSM Commercial Driver Training we are seeing a steady increase in women training to drive with us. For both professional and personal reasons, more and more women are getting behind the wheel of larger vehicles such as a HGV or a PCV, or learning to tow a trailer. In some cases it is as simple as wanting to be able to transport their horses in a small lorry or a horsebox, or to tow a trailer of some sort. More frequently we are now seeing women training to drive with us because they wish to pursue a career as a commercial driver. Sarah from Canvey Island in Essex is a fine example of one of our female trainee drivers. Having worked as a qualified hairdresser for a number of years, Sarah decided upon a change of career. Having come from a family of truckers, she had often felt a calling towards a career behind the wheel. 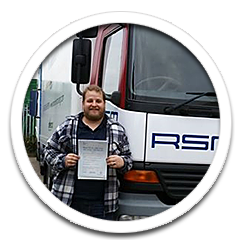 Sarah came to us to get her licence to driver a truck, lorry, or as we call it a HGV – Heavy Goods Vehicle. First of all Sarah did her HGV Category C driver training and having passed the driving test she then did a drivers Certificate of Professional Competence (CPC) with us. Since obtaining her HGV Category C licence Sarah has worked as a Tipper driver for the JKS Group, a construction engineering company based in Rochford, Essex. Having established herself as part of the team at the JKS Group, Sarah can easily be spotted on the roads of Essex thanks to the tipper truck that she drives being wrapped in bright pink to support Breast Cancer Awareness. The pink Scania tipper truck can be seen out on the roads of Essex making heads turn. Named ‘Nanny G’, the truck will appear at community events throughout Essex this summer and beyond to encourage visitors to contribute to Sarah’s fundraising for Against Breast Cancer. It’s been a good move for Sarah and she has already told us that she plans to come back for more training in the future – ” I will be aiming to do my Class 1 Artic in the future, but for now I’m happy driving my pink lorry and raising awareness for Breast Cancer”. Good luck with the driving career Sarah, and to yourself and JKS in raising awareness for such a worthy cause! Are you thinking about a change of career? – How about a career that is going places? Have you thought about learning to drive a lorry, a truck or what we call a Heavy Goods Vehicle (HGV), or a Passenger Carrying Vehicle (PCV) such as a coach, bus or minibus? At RSM we offer comprehensive training and 1-2-1 personalised tuition with our expert driving instructors. We like to think we are the first step in starting out in a career as a professional driver. Our training is designed to not only give you the ability to pass the driving tests, but also to make you a competent, aware and safe driver before you go out on the roads alone. If you are interested in starting a driving career, please read the course information on this website and feel free to contact us for more information, help and advice, or to book your place on one of our driver training courses. If you would you like to learn to drive a LGV, HGV or PCV, to tow a trailer, or you are interested in starting a career in commercial driving, speak our team for some free advice on how to get started? – Contact us today!